How to track VET graduates? 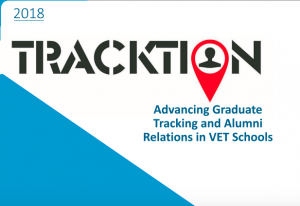 TRACKTION project which focuses on improving VET graduate tracking at institutional level. Tracking is commonly understood here as all systematic approaches that VET institutions put in place to record information on graduates, with regard to their learning progress, skills acquired, perceptions, routes into employment, self-employment, or further training. The project has released its Baseline Study, the first output of the project. The document provides a concise summary of the state of art of tracking and alumni initiatives in nine VET schools in four European countries (Estonia, Italy, Netherlands and Spain). Descriptions are supported by factual information on reasons, uses, methods and obstacles encountered. While the coverage area is constrained to the countries represented in the consortium, the insights will hopefully contribute to European and country-level debates around this interesting topic. For more information on the project, feel free to email us.